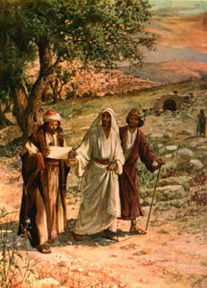 The Gospel of Luke tells the story of two men walking to the village of Emmaus from Jerusalem. As they walked along, they were discussing the events of the day. Jesus came up and walked with them and talked with them but they did not recognize him. As they walked and talked, Jesus explained how those events fulfilled the prophecies in the scriptures. As they reached Emmaus, they invited Jesus to stay with them and to eat with them for the day was nearly at end. As Jesus broke the bread and gave thanks, their eyes were opened. They recognized the living Christ before He disappeared from their sight. They rejoiced and returned at once to Jerusalem to tell the disciples. 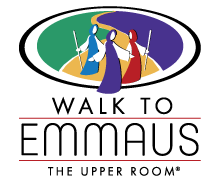 The Walk to Emmaus is a spiritual renewal program intended to strengthen the local church through the development of Christian disciples and leaders. The program's approach seriously considers the model of Christ's servanthood and encourages Christ's disciples to act in ways appropriate to being "a servant of all." 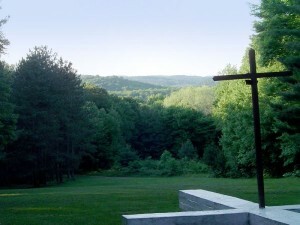 The Walk to Emmaus experience begins with a 72-hour short course in Christianity, comprised of fifteen talks by lay and clergy on the themes of God's grace, disciplines of Christian discipleship, and what it means to be the church The course is wrapped in prayer and meditation, special times of worship and daily celebration of Holy Communion. The "Emmaus community" made up of those who have attended an Emmaus weekend, support the 72-hour experience with a prayer vigil, by preparing and serving meals, and other acts of love and self-giving. The Emmaus Walk typically begins Thursday evening and concludes Sunday evening. Men and women attend separate weekends. During and after the three days, Emmaus leaders encourage participants to meet regularly in small groups. The members of the small groups challenge and support one another in faithful living. Participants seek to Christianize their environments of family, job, and community through the ministry of their congregations. The three-day Emmaus experience and follow-up groups strengthen and renew Christian people as disciples of Jesus Christ and as active members of the body of Christ in mission to the world. What is the Walk to Emmaus Experience? Who Should Attend a Walk to Emmaus? Another intent of the Walk to Emmaus is to build strong Christian leaders for the home church. The church cannot exist with clergy alone; it takes a strong lay leadership to help effectively build the church into a Christ-loving, Christ-following fellowship. A person who attends a Walk to Emmaus with an open heart to the love of Christ can expect to return home as a stronger Christian leader. If you have experienced a major life changing experience such as the loss of a loved one, a divorce, the loss of a job, etc., you should consider postponing your walk until you have worked through your emotions from that event. For a Walk to Emmaus to be effective, the participant should be able to focus on the events of the weekend and not on events or activities back home. If you are unsure if you are ready to attend, perhaps you are not. Consult your pastor or another trusted Christian friend to determine if you are emotionally ready for the weekend. Pray about it; God will tell you when you are ready. When Are Heart of Ohio Emmaus Walks Held? The Heart of Ohio Emmaus Community currently holds four walks per year: A men's and a women's walk are held early spring (generally March and April) as well as in the early fall (generally September and October). We try to schedule our walks around holidays and vacations. For further information about upcoming Walks, please visit our Community Calendar page. Where Are Heart of Ohio Emmaus Walks Held? The Heart of Ohio Emmaus and Chrysalis community holds its Walks to Emmaus and Chrysalis Flights at Otyokwah Camp and Retreat Center. 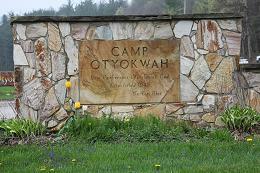 Camp Otyokwah is a 260 acre Christian camp located at 3380 Tugend Road near Butler, Ohio, a few miles west of Mohican State Park. The facility is owned and operated by the Great Lakes Conference of the Churches of God. Meals are served in the spacious Hopewell Hall dining hall featuring seating for 260 people, a cathedral ceiling, a beautiful stone-faced fireplace, and state of the art sound and video systems. Just outside the dining hall and down a short hallway is the conference room with seating for 90 people where the team and the pilgrims listen to and discuss the talks presented. Delaware Lodge is a single story building with a full length front deck facing Hopewell Hall and the scenic, lake-covered valley. 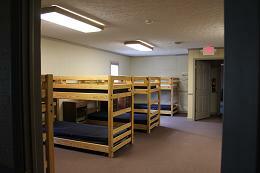 This heated facility has six separate dorm style rooms with four full restroom facilities and a total capacity of 80. 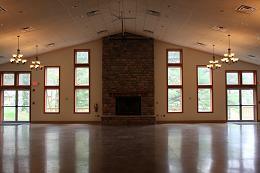 The Commons meeting room, located in the middle of Delaware Lodge, seats 50 people and is used for sponsors' hour and various chapel services throughout the weekend. Are you interested in attending a Heart of Ohio Emmaus Walk? We invite you to join in an exciting three days spent in meeting Jesus Christ as your friend who comes to you in God's love as expressed through other Christians. Come experience the love of Jesus Christ in a deeply enriching weekend! Click here to download an Emmaus Application. Our community covers a large geographical section of the state of Ohio. The approximate center is Mansfield in Richland County. If you are interested in attending a Walk to Emmaus but do not live in the Heart of Ohio area, visit the International Emmaus Home Page. Click on the "Find Emmaus" link on the page to locate an Emmaus community closer to your home. • All meals are provided; however, be sure to notify your sponsor if you have any special dietary concerns such as diabetic or gluten-free meals. • Please leave your watch, cell phone, I-Pad, etc. at home or with your sponsor. It will help you keep your focus on the weekend. Need More Information About Emmaus?